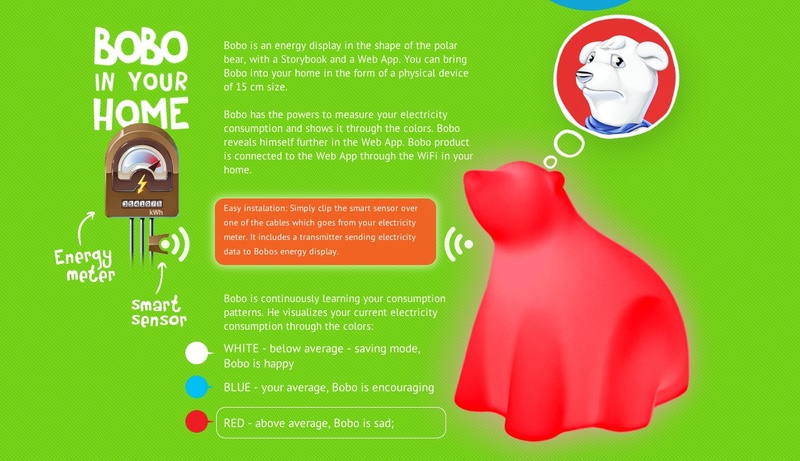 Meet Bobo, a plastic polar bear that monitors your home energy consumption and glows different colors based on your energy consumption. The device is aimed at teaching children about reducing their electricity use, and comes with a sad, sad story about saving polar bears from dying because of climate change. This is one of the most depressing backstories I’ve seen associated with a connected device — but the real-time feedback it could offer via ambient information is exactly what I want to see more of in the connected home. The figure is cute and the simple way of presenting data provides exactly the information that could get someone to change their behavior. The prospective device uses a home’s Wi-Fi network to connect to the internet, and reads your electricity usage from a clip attached to the wires going into your electric meter. When you consume a less-than-average amount Bobo the bear glows white. When you consume an average he glows blue. And when you are sucking down energy like a frat boy at a kegger, Bobo glows an angry red. An accompanying web app offers ways kids can help nudge Bobo toward the cooler end of the spectrum. The team behind the product hopes it will be out toward the end of the year, but there’s no word yet on cost. It’s designed by an Oslo-based company called Caretosave (hat tip to Alexandra Deschamps-Sonsino for linking me to the project). From a connected home perspective this device would be way cooler if it talked to a connected smart meter, instead of relying on a clip to track electricity usage, but it’s still early days and we don’t have standards and APIs widely available that would make that possible. Still, imagine a future where you had one of these specialized Belkin sensors that could track your electricity usage by device attached to your meter. Then imagine letting your connected thermostat, Bobo the bear and any other device use that data to show you bits and pieces of information that matters based on the device, time of day and your role in the home. For example, Bobo might tell kids to turn of their lights, but probably can’t tell them to turn off the dryer (a big energy hog). However, the dryer or maybe a job scheduling dashboard might make a recommendation to mom that now is a good time to start a load of wash from an energy usage perspective. Or maybe a simple light on the washing machine or dryer could flash red when energy usage and costs are high. Obviously, if you need clean clothes then you can ignore it, but then I’d avoid walking past the sad polar bear in your kid’s room. I may be overly optimistic here, but giving people real-time information about their power usage seems like a great way to get them excited about conservation (and saving money). And this glowing bear with its guilt-inducing backstory seems like a good way to start. This might just be a fabulous way of conning people into getting smart meters so our government can control our lives even more. How about having a look at your non-smart meter reading every week and turning it off at the wall? How about not emotionally blackmailing us into allowing a technology into your home that can monitor every move you make and that stinks of George Orwell’s futuristic vision of 1984?